Aliso Viejo, California – The 3ARR Series is Zettler Controls, Inc. latest offering in our growing line of products for the HVAC/R industry. This series of potential relays is used to assist in the initial function of single phase motors which employ start capacitors for high torque. Common applications include air conditioning, commercial refrigeration, heat pumps and more. 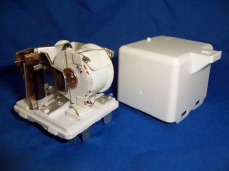 The coil of a potential relay is energized by the potential of the start winding. When this voltage is raised to the pick up value the contact will open and disconnect the start capacitor. The relay will remain energized until the start winding voltage is removed or decreases below the drop out value. Design, construction and production line from original GE product offering. 50 & 60 HZ at various coil voltages from 117V to 564V range.